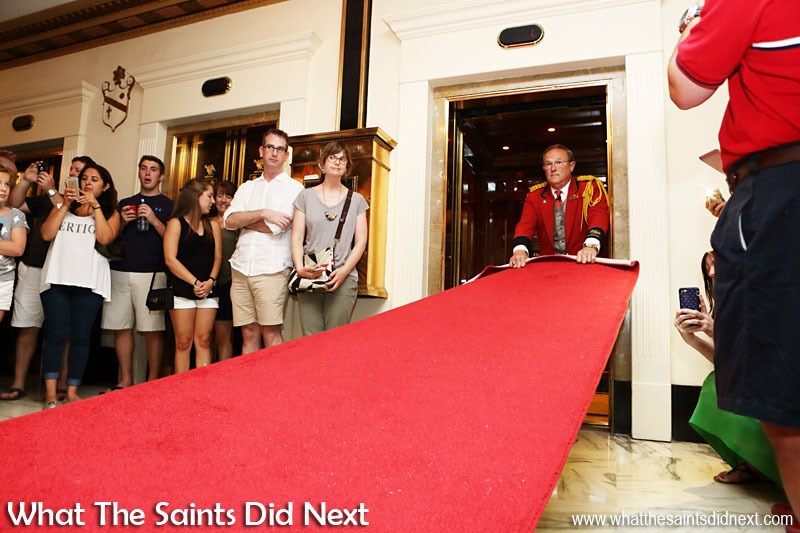 Peabody Hotel Memphis Duck Master getting the red carpet in place. 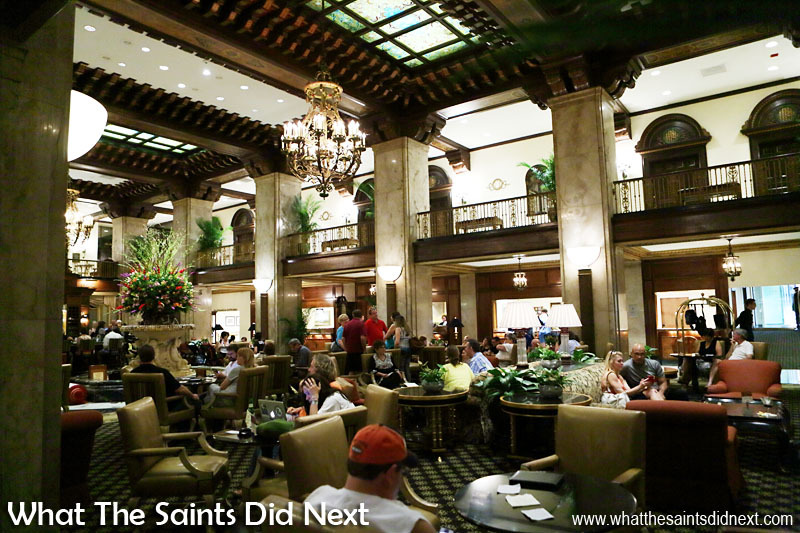 The Peabody Hotel, Memphis Tennessee is buzzing with anticipation as dozens await the start of one of the quirkiest of American attractions. 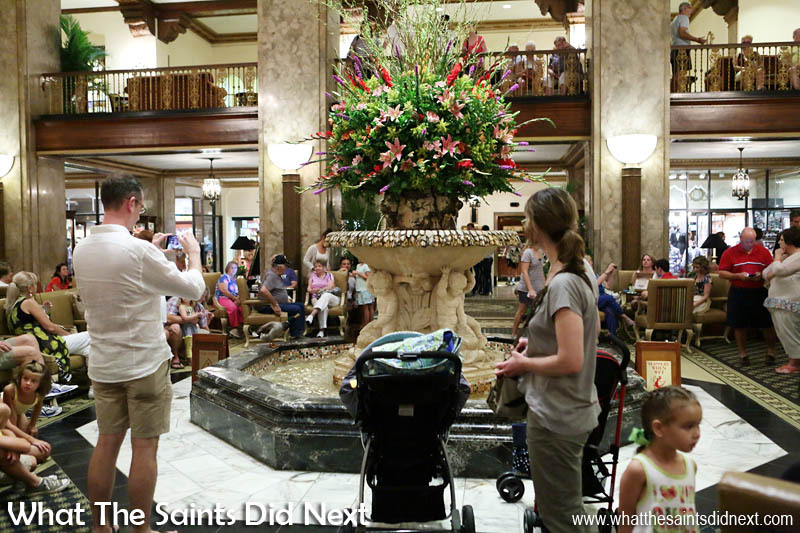 We’ve all come to see the famous Peabody Hotel ducks. It’s one of the free things to do in Memphis and also, quite clearly one of the popular things for kids to do in Memphis as I’m sitting here on the hotel floor competing with kids mostly, for viewing space. We’re going to watch a bunch of ducks waddle on a red carpet. It makes me realise that perhaps, back home in St Helena our quirky traits could have a definite role in our fledgling tourism venture. The Marching Peabody Ducks in Memphis, Tennessee are a 5 o’clock guarantee, so much so that they place fourth in the world’s top 10 most reliable tourist attractions. According to the ‘Duck Master’ anyway. 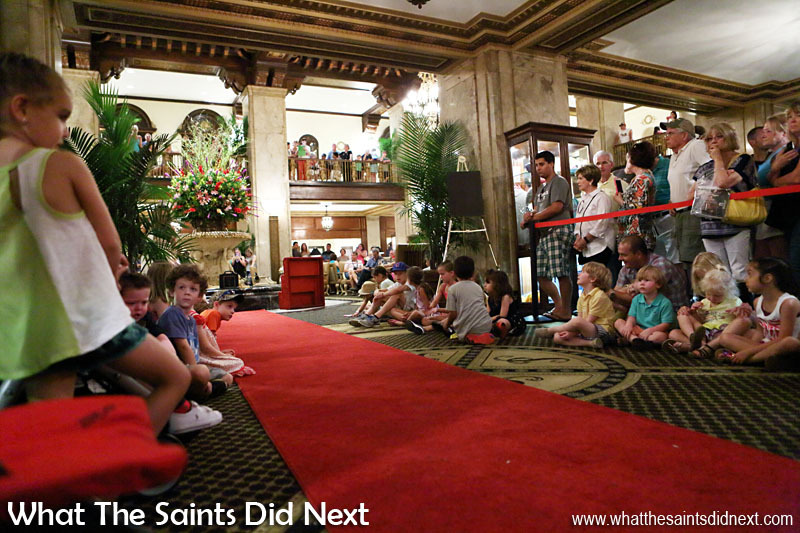 Inside the Peabody Hotel, tourists assemble in anticipation of the marching Peabody Ducks. Peabody Hotel Memphis Ducks, completely at ease with all the people crowding around to take pictures. 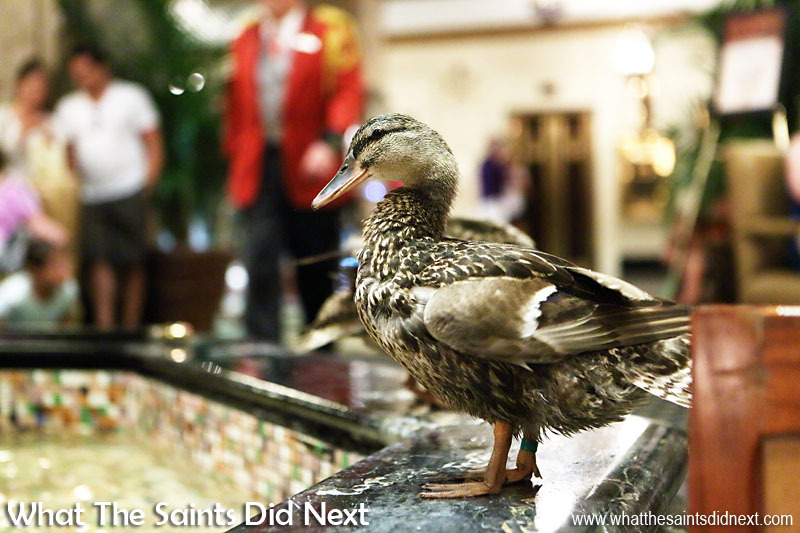 The Peabody Hotel is quite posh, which makes the presence of ducks in the lobby very quirky. I should share my background research to how this spectacle of a hotel in Memphis with ducks came about. 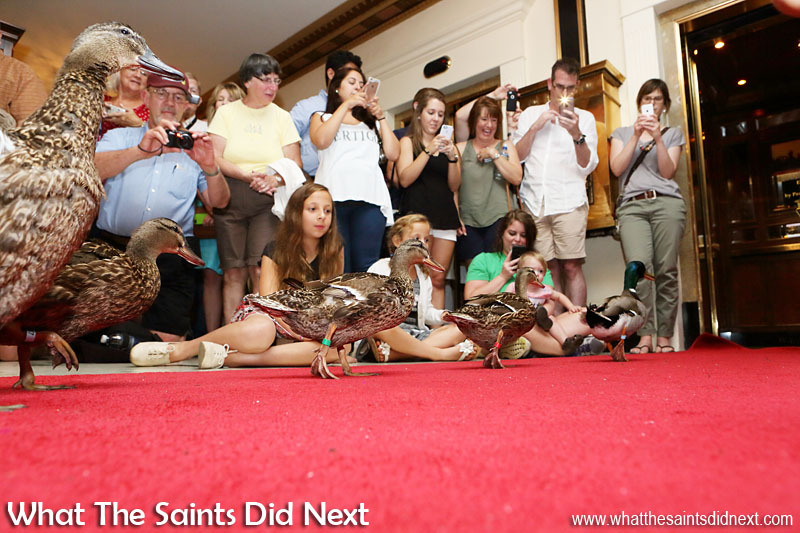 In the Peabody Hotel, in downtown Memphis, ducks have been kept on the roof since the 1930s. Every morning at 11am they are brought down in the lift to the hotel lobby fountain. The ducks are trained to ‘march’ the 10 metres to the fountain where they spend the day. They are then ‘marched’ back to the lift at 5pm, returning to a specially constructed $200,000 enclosure on the roof. Not too shabby. Marketing gurus everywhere must drool at the success of this simple formula that pulls in people from far and wide. The eccentricity of the whole thing taps into our natural curiosity for anything unusual. We thought we’d get here early, but at 4.25pm the lobby is already very full. Clearly the Memphis duck hotel is a big draw. The ducks seem unfazed by the attention, happily splashing about, in and around the fountain as though ducks in the lobby of a posh, four-star hotel is normal. With 25 minutes to go the ceremonial red carpet is rolled out and prime viewing spots are quickly claimed. Children sitting cross legged on the floor are in front, which is where we are too, nicely positioned near the lift doors. 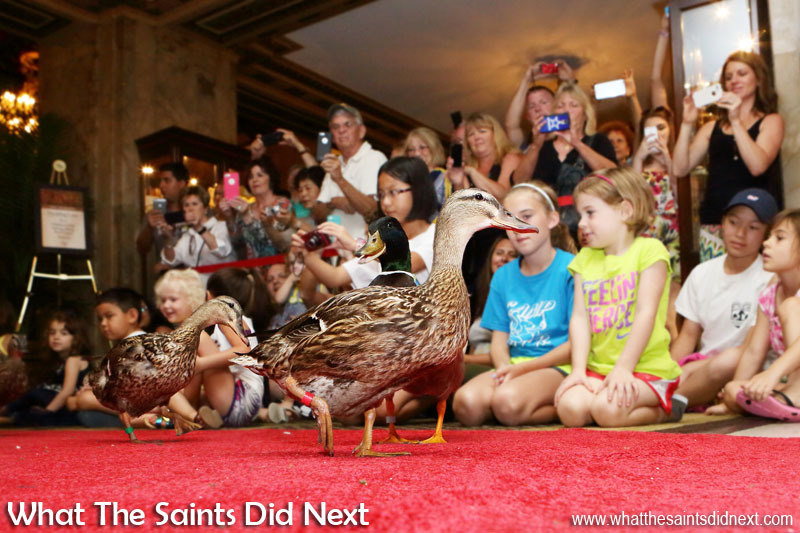 Everyone is in position, the red carpet is down, we are ready for the march of the Peabody Ducks. The Duck Master makes a grand speech about the traditions of what we are about to witness, as the well drilled ducks, line up behind him, waiting on the signal. It’s fantastic drama. And then, 5pm on the dot, the ritual begins. The ducks waddle up the red carpet as dozens of camera flashes go off. I’m trying to get a shot from floor level so I’ve pre-focused the camera on wide angle, set focus to manual and am shooting blind, or real ‘point and shoot’ to be exact. The march is underway and the ducks perform like true professionals. Marching Peabody Ducks in Memphis underway at the Peabody Hotel, in Memphis, Tennessee. The marching Peabody Ducks with their stuttery motion, waddle by ahead of the Duckmaster. They glance left and right at their audience as they go. In a moment it’s all over, the lift doors close and the famous Ducks are gone. Everyone is smiling and comparing pictures. We’ve all just watched some ducks walk past but it could have been a Hollywood celebrity, that’s how we feel. How mental is that? “Suckers,” I imagine the marketing guys saying while rubbing their hands together with glee. But I don’t care. I heard about the Peabody Hotel Memphis Ducks many years ago, so I feel privileged to have finally now seen them. Some of the souvenirs in the hotel gift shop. Could We Train A Tortoise? I mentioned St Helena earlier – the whole spectacle has me thinking. Back home we have a few ducks, even more chickens. We have our famous endemic wirebirds; could we train the wirebirds? Perhaps Jonathon our giant tortoise could perform a ceremonial entry to the paddock each day? Mind you, that could take forever with a tortoise and especially one that’s believed to be over 180 years old. We leave the hotel and start walking toward Beale Street to find something to eat. We can’t stop talking about the ducks. According to the Peabody, in 1933 the hotel’s General Manager, Frank Schutt and a friend, Chip Barwick, placed the ducks in the fountain as a joke after consuming a little too much Jack Daniel’s Whiskey. 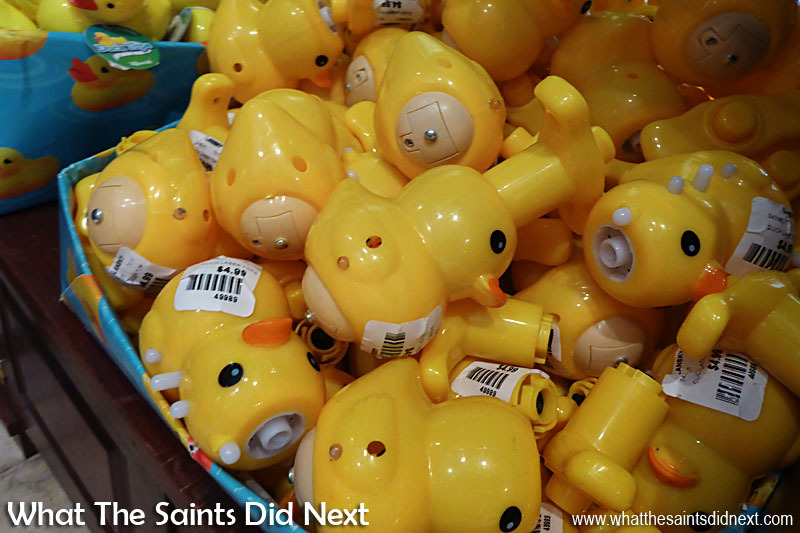 However, the ducks proved so popular with guests that they became a permanent feature. In 1940, Edward Pembroke, a former circus animal trainer, then a bellman at the hotel, offered to help train the ducks. He became the first official Peabody Duck Master, a position he famously held for 50 years. The ducks have gained celebrity status over the years, however, their stint at the hotel lasts just three months before retiring to a local farm. 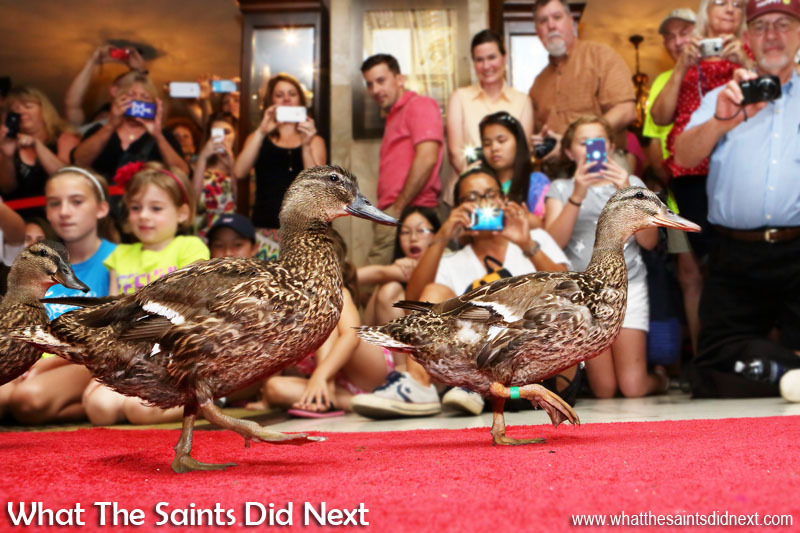 The Peabody Hotel Memphis Ducks are five North American mallards. One drake (male) with white collar and green head and four hens (females) with less colourful plumage. Duck is not served anywhere at The Peabody and has not been seen on the hotel’s menu since 1981. This, quite possibly makes Chez Philippe the only French restaurant in the world that does not offer duck. Sorry, I got my days mixed up. We drop the possum on Jan 1, we let the groundhog see his shadow on Feb 2. We have a possum drop every Feb, 2 in North Carolina, hard to believe what people will go see. I’m enjoying your road trip around the world. Just looked up the NC possum drop Larry, hadn’t heard of this one. Fascinating tradition. Thanks for your comment and feedback – next time we’ll have to try make it to North Carolina. Cheers.